Get coupons, sale notifications and shipment updates. For "in town" shoppers, we offer "Warehouse Pickup" service. Just order online and ask us to remove shipping costs (except a $3.00 picking/packing charge). We can then arrange for a warehouse pickup, Monday-Friday, 10 AM - 2 PM EST. 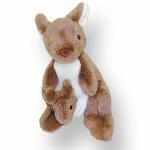 Koala & Kangaroo Hat Pin 1"